We’d love your help. Let us know what’s wrong with this preview of Emma the Bumble Bee by Monica Dumont. Emma is a young bee on her first day going out to collect pollen. Every young bee is intrusted with this important duty and Emma has to find within herself the strength and inner wisdom that is every bee's birthright. This book comes with a unique exercise designed to help parents support their child in developing self-trust and personal strength. To ask other readers questions about Emma the Bumble Bee, please sign up. I'm surprised not to see a description posted on this book. It is a great book for ages 4 to 6. With a sweet story line that teaches children to trust themselves. A teaching for life, that's for sure. The book also has a unique exercise for parents and children to do together. It’s great at creating a bond with the child and to take the teaching of the book further. Doing something for the first time is scary for children! Even for adults it can be intimidating! But it’s our job to teach and empower our children to trust themselves to try and succeed at new things. Emma the Bumble Bee is a great book that will help little ones learn the importance of this and see that they are not alone. Emma is a cute little bee! My four year old daughter Paige immediately commented on the flowers on her head and how pretty she was! While illustrations are meant to graphica Doing something for the first time is scary for children! Even for adults it can be intimidating! But it’s our job to teach and empower our children to trust themselves to try and succeed at new things. Emma the Bumble Bee is a great book that will help little ones learn the importance of this and see that they are not alone. Emma is a cute little bee! My four year old daughter Paige immediately commented on the flowers on her head and how pretty she was! While illustrations are meant to graphically depict what the words express, usually for my daughter and many little ones it’s what grabs their attention first. That’s why they can make or break a book! Monica Dumont’s illustrations are cute and just up Paige’s alley. The bright bold colors grab the attention of little eyes and help their little ears to tune in. Paige doesn’t have a confidence problem and the majority of the time she is willing to jump in and try new things. But once in a great while she will tell me she is scared. While it always surprises me, I realize it’s more normal than it is to not be scared and is a great teaching opportunity. Recently Paige was doing her homework and there was a page she didn’t understand how to do. She just kept saying “I can’t do it” and was scared to even try. She is my little perfectionist and is devastated if she messes something up. If she fears she will fail, she is scared to try. I reminded her of Emma the Bumble Bee and we took a break and read the book and how it could apply to Paige’s situation. I love when I have tools like this at my disposal to help in my parenting! "What we remember from childhood we remember forever", said Cynthia Ozick. It's during that brief and wonderful season of our lives that our early experiences leave a firm imprint on the future development of our personalities. What in our dispassionate eyes of adults is just part of a routine, can be a real challenge for our children - a steep road source of self-doubt and anxiety. 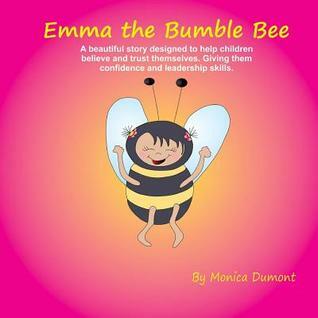 The exercise at the end of the story is meant as a fun guide to help suppor When writing Emma the Bumble Bee, I thought of how insecurities can easily be overcome by just having the knowledge and the practice of trusting ourselves. Sweet story combined with beautiful bright colours. I like what it has to say about trusting oneself. Great picture book. I like the message. Perhaps we should all learn from this and put it into practice more often.